The world of social media marketing is always brimming with good news, isn’t it? Time and time again, we read how companies and brands reaped amazing results from their social media marketing efforts. Like achieving 354 percent ROI from their month-long Facebook advertising campaign, doubling their website traffic in three months through savvy social media content, or gaining 10,000 new fans through a well-executed social media campaign in just three short weeks. Done well, social media marketing can yield disproportionate outcomes and benefits compared to other marketing strategies. However, you probably know that not everything which social touches turns to gold. For every success story, there are probably numerous others which went wrong – sometimes in the most spectacular way. Just recently on 7 October, esteemed “Real Beauty” toiletries brand Dove got into a fix when they ran what many saw as a racist ad on Facebook. 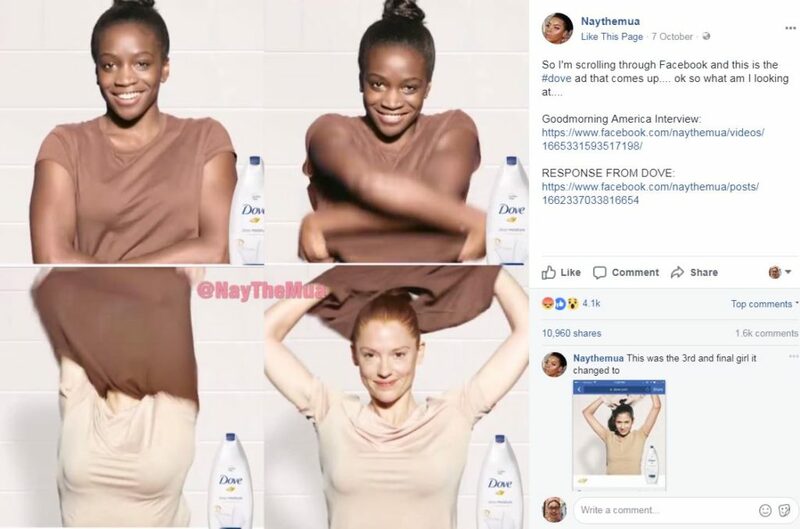 The Unilever beauty brand posted a three-second video on its US Facebook page, which showed a black woman removing her top to reveal a white woman beneath. While Dove has apologised for the mistake and removed the offensive ad, pundits have declared that its mistake could cost it dearly. Dove isn’t the only brand to commit a social media faux pas. Here some of the most infamous examples in the past year. Let us see what we can learn from them. Our first candidate is an online video ad featuring Thai celebrity Cris Horwang pushing a beauty product. “Just being white, you will win,” says Cris Horwang in the 50-second spot by Seoul Secret, a Thai beauty company. As you’d imagine, the ad received an overwhelmingly negative reaction, which resulted in the company issuing an apology for its mistake. While praising the virtue of pale-skin in favour of dark-skin was – and is – a big no-no, mistaking one black celebrity from another is virtually unforgivable. 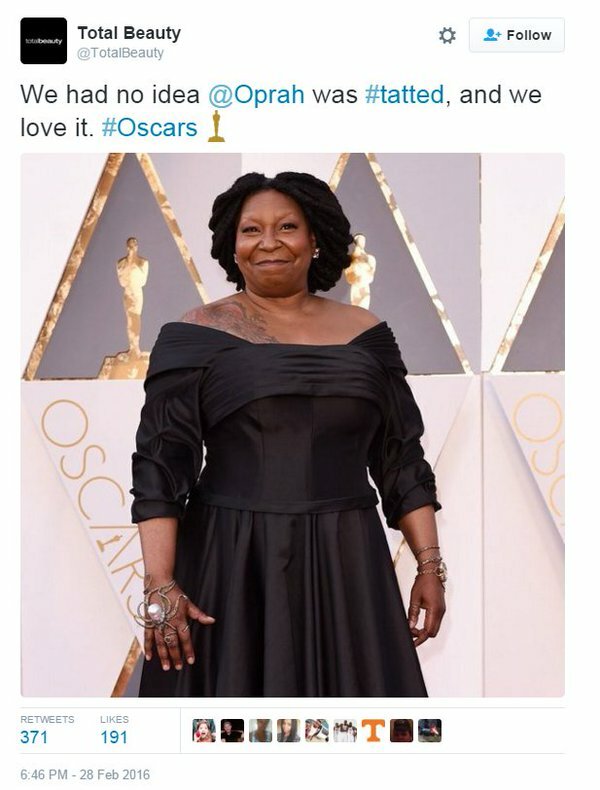 Especially when we’re talking about two of showbiz’s biggest screen queens – Oprah Winfrey and Whoopi Goldberg. 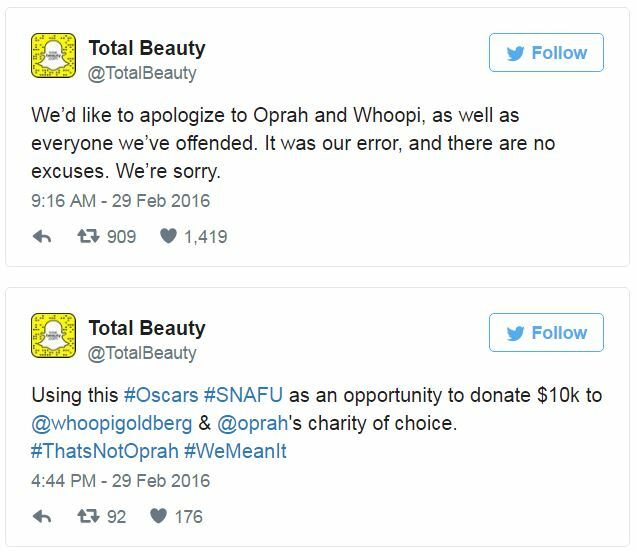 Have a look at this tweet from Total Beauty. Fortunately, the company apologised for its mistake, and it deleted its tweet thereafter. It also offered restitution to the two stars by offering to donate US$10,000 to both stars’ charity of choice (images below from The Guardian). 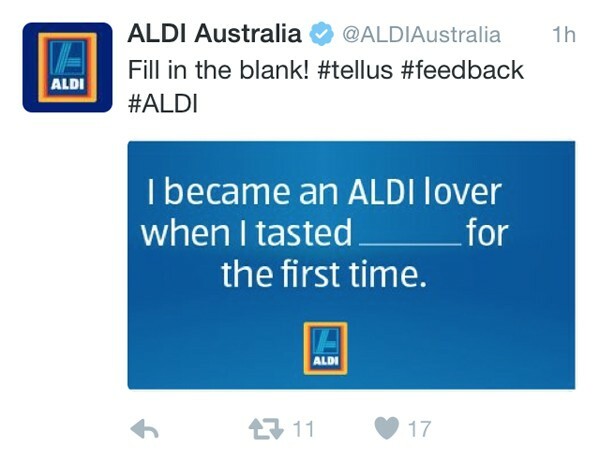 In yet another Twitter fiasco, ALDI Australia’s campaign encouraging Twitter fans to fill in the blanks attracted all kinds of responses. Including some pretty snarky ones. Well, all ALDI did was to encourage their fans to tell them why they love ALDI by filling in the blanks. Sounds simple enough right? Unfortunately, the discount supermarket chain attracted all kinds of rude answers as its campaign was waylaid by pranksters. Notable answers from their “fans” included words such as “horse”, “diarrhea”, “butts”, “your mum”, “unemployment”, “special bargains from China” and other hilarious/naughty answers. The moral of the story according to Smart Company was that brands should know their target audiences better. This would prevent the inadvertent hijacking of their campaign by trolls. Now customer service is where social media is supposed to excel at, right? After all, you did set up your company’s Facebook page to serve your customers better. However, not when your customer service agents are bots, or even worse, are humans who behaved like bots. 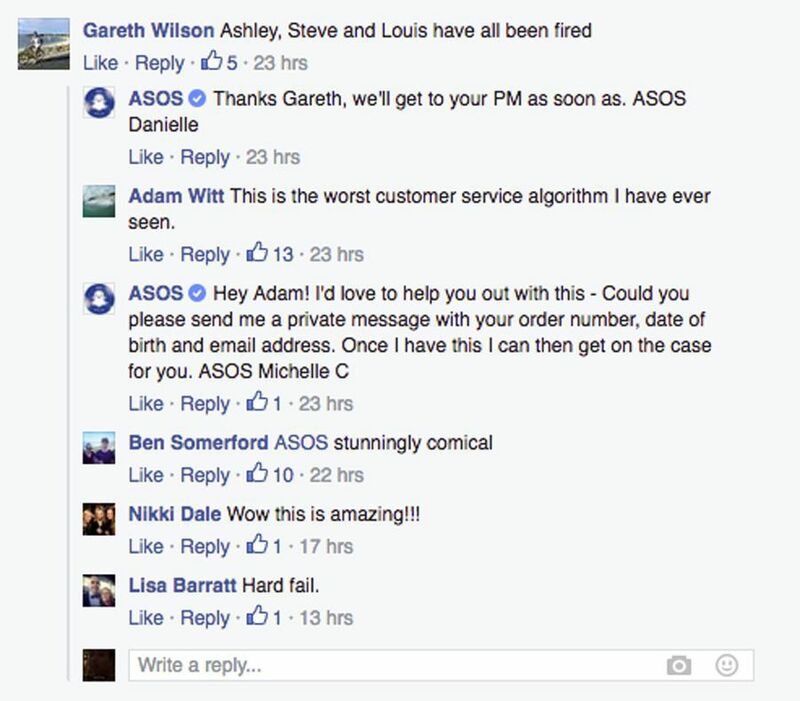 Like in this story on ASOS Facebook’s customer service on Mashable. 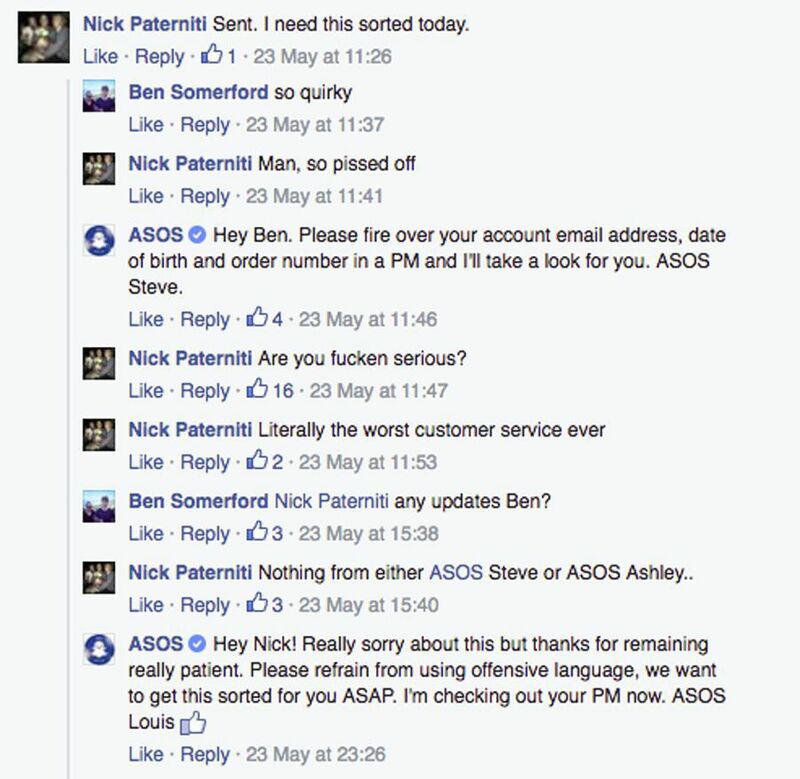 According to Mashable, Nick Paterniti from Perth, Australia first wrote a post on fashion retailer ASOS’ Facebook page asking for a refund after he ran into some trouble with their customer service team on email. “Your customer service team via email is not helping although I’ve repeatedly provided the details they’ve asked for. Please sort this out ASAP,” he wrote. What should have been easily resolved, however, turned into a legendary ping-pong match of wits between Nick and ASOS, with a few different personalities joining the fray. Have a look at the Facebook captures below (courtesy of Mashable). 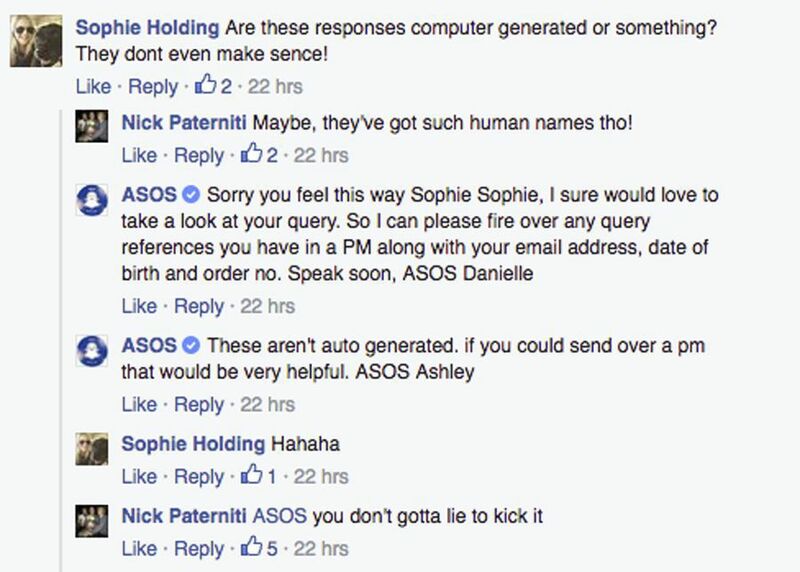 Some of the responses from ASOS are possibly miffling. How would you react if you came across a tweet such as this just days after Carrie Fisher passed on? Well many of her fans (which probably numbered millions) were furious. 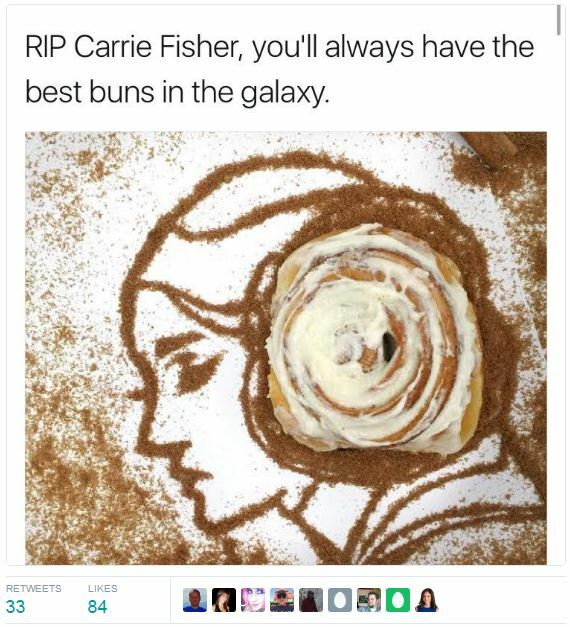 While Cinnabon did attempt to offer their condolences to the late Star Wars actress who played Princess Leia, their attempts to milk her untimely passing for commercial gain rubbed many people off in the wrong way. The confectionery brand was eventually FORCED to issue an apology while their tweet continued to remain in cyberspace long after the issue had blown over. If you’re a creator of violent shoot ’em up games, nothing can be sacrosanct right? According to Polygon, Battlefield 1 publisher Electronic Arts – or more specifically, their social media team – came under tremendous fire when they tried to glorify World War I to push their newest video game. 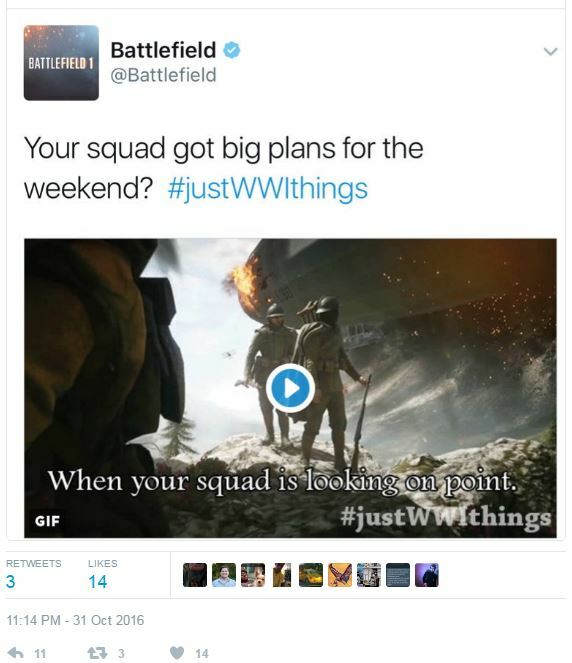 Using the hashtag #justWWIthings, they included supposedly meme-worthy phrases such as “weekend goals” as well as GIFs with violent images from the Battlefield 1 game. Have a look at this GIF of a soldier being “burned alive” by a flamethrower with the phrase “when you’re too hot for the club” overlaid. You can see a screencap of the original tweet below, along with the GIF. Or this tweet which came with the same offensive hashtag. Finally, in a ghastly demonstration of total insensitivity, a mattress store in San Antonio, Texas, did something almost unthinkable. To ramp up sales in a rather slow month, the company Miracle Mattress created a video which showed store manager Cherise Bonanno and two employees standing in front of two piles of mattresses which symbolised the World Trade Centers. At the end of the video, the two employees fell into the stacked mattresses. As you’d imagine, the backlash was extremely severe. Bonanno apologized profusely for the “stupid” ad. “It was a stupid idea that we sent out and we apologized for our stupidity and we really hope you forgive us for what we have done,” she told WOAI-TV. Unfortunately, her actions were so disastrous for the company that it had to close down indefinitely after the incident. 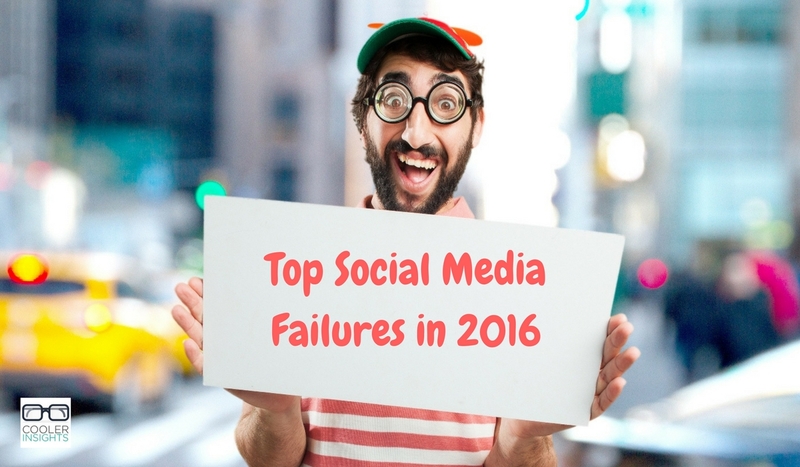 Were there other major screw ups on social media last year? Let me know so that I can add to this list.